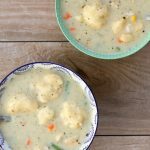 Instant Pot Thai Coconut Soup–sometimes this soup is called Tom Kha Gai or coconut galangal soup when you order it at a Thai restaurant. Don’t be scared off by the name. This is a super easy version that even a beginner cook can handle. It has the most amazing broth ever. Coconut milk, thai curry paste, lime juice and lemongrass all combine to make a soup that is surprisingly life changing. The first time I had this soup was in a small Thai restaurant in Orem, Utah with my sister Gina. She ordered the soup for the table and assured us we would like it. I tried it hesitantly and was immediately flooded with the most amazing flavor combination of my life. I wanted to dive into the soup bowl and swim in the broth, it was that good. 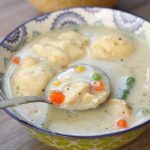 My version of the soup is super easy and probably has half of the ingredients that they use to make it at a restaurant. I found all of these ingredients at one normal grocery store. However the basic elements are there to produce a broth that will have you skipping around the kitchen with glee. Coconut Milk: look in the Asian section of your grocery store. I buy the full fat kind and I don’t regret it. I usually buy the Thai Kitchen* brand. Don’t buy coconut water or cream of coconut or Silk coconut milk that you’d pour on your cereal. Red Curry Paste: this product is found in the Asian section of your grocery store. I buy the Thai Kitchen brand*. Mushrooms: I just use plain old white button mushrooms. I used about 6 ounces of mushrooms when I made this today but I feel that I could definitely go heavier on the mushrooms. They shrink down so much. Lemongrass: I use the tube of lemongrass that you can find in the produce section by herbs in your grocery store. Fresh lemongrass is harder to come by. This seems easier to use and to find. 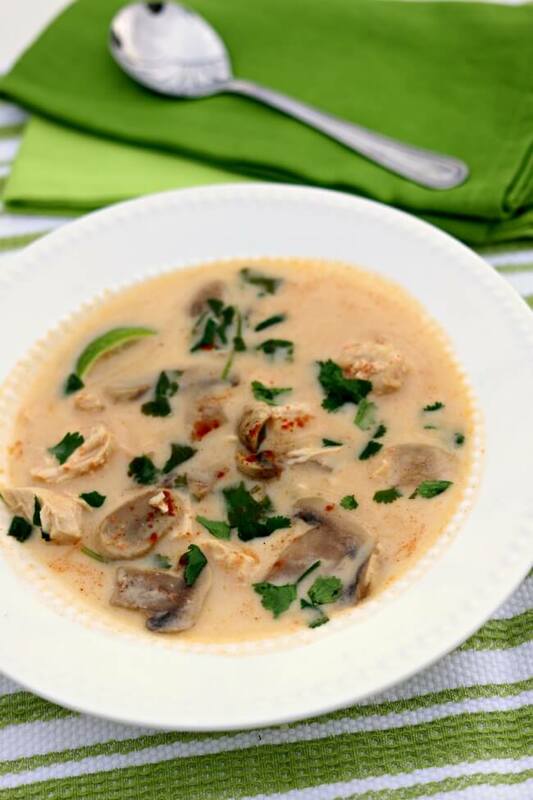 For Instant Pot Thai Coconut Soup I used my 6 quart Instant Pot Duo 60 7 in 1*. 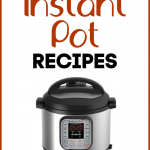 I also own the 6 quart Instant Pot IP-LUX60 V3 Programmable Electric Pressure Cooker. * They are both great pressure cookers! The first one I mentioned has a yogurt making function but other than that they are fairly similar. The price difference between the two is about $20. 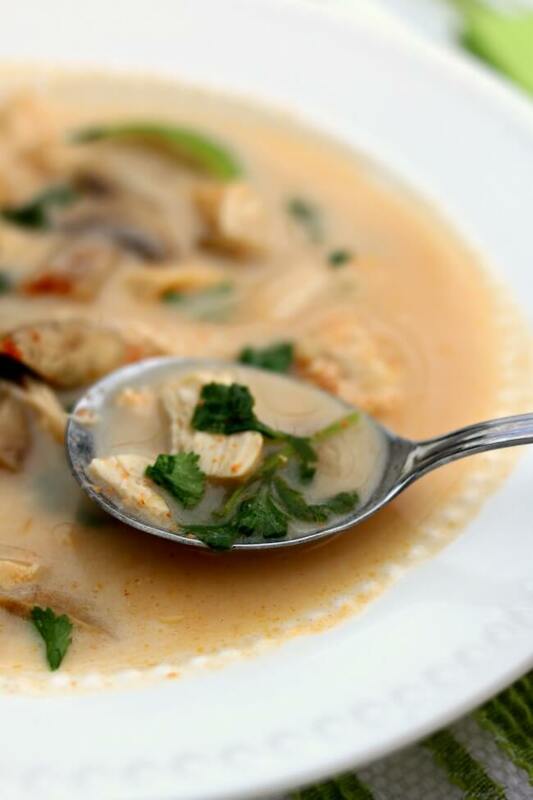 Sometimes this soup is called Tom Kha Gai or coconut galangal soup when you order it at a Thai restaurant. Don’t be scared off by the name. This is a super easy version that even a beginner cook can handle. It has the most amazing broth ever. Coconut milk, thai curry paste, lime juice and lemongrass all combine to make a soup that is surprisingly life changing. 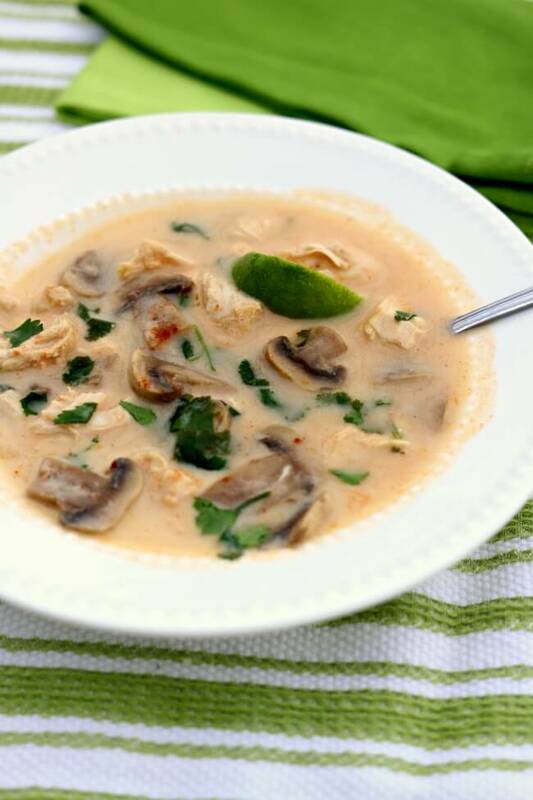 Add chicken broth, chicken, mushrooms, curry paste and lemongrass paste into the Instant Pot. Cover and secure the lid. Make sure valve is on “sealing.” Set the manual button/pressure cook button to 10 minutes. Let the pressure release naturally for 10 minutes and then move the valve to venting. Remove the lid. Cut the chicken into bite-size pieces. 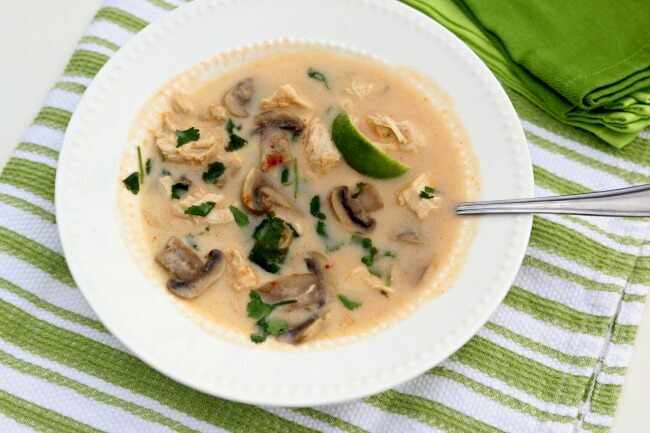 Stir in the coconut milk and the juice of 2 limes. Stir in the cilantro. Salt and pepper to taste. 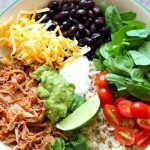 I’m so excited to try this recipe, thank you for posting! Do you use sweetened or unsweetened coconut milk? Thank you! unsweetened. I find it in the Asian section of the grocery store. Can I use green curry paste instead of red? Trying the recipe now. I’m so excited! I am new to the pressure cooking game. I set my 8qt to manual and cooked for 10 minutes, but the chicken was still raw. I have turned it back on for another 10 minutes. Is this because my cooker is bigger? If so, what’s the typical conversion between the cooker sizes? That seems really weird to me! 6 and 8 quart really shouldn’t be much different. Did you use low or high pressure? That would make a difference. 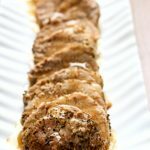 I used frozen chicken breasts in my 6-qt Duo, and it was cooked through after ten minutes at high pressure, followed by ten minutes of natural release. The same thing happened to me with my 8 quart. can you use real lemongrass? how much? yes use 2 stalks of bruised lemongrass. This was absolutely delicious- my kitchen smelled like lemongrass! My husband and I devoured the entire thing for one meal. 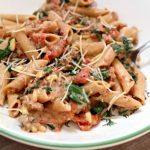 Due to it being so delicious, I recommend doubling the recipe, you’ll want leftovers! I love the broth of this soup I could drink it! 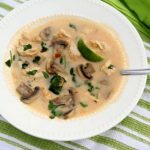 We enjoy a Thai chicken soup recipe which is a bit of several other recipes– I have never used the Instant Pot for soup–still getting used to it– I added fish sauce, galangal, and some dried Thai chili FLAKES to get it closer to our recipe and enjoyed this! Thank you!! How is it possible to cook chicken for just 10 minutes? Because it’s a pressure cooker and it cooks so quickly. My family loved this soup. Thank you! Hi! This looks amazing! Can you tell me what how many servings this recipe will make? Thanks! Does it turn out pretty spicy? NO It’s so good! Try it! Hi Karen! Does it also work to cut the chicken into bite size pieces before cooking? Yes that will work great. Cut pressure cook time down to 5 minutes.